European pine shoot moths were first discovered in North America in 1913 in New York State. In Canada, they were reported in 1925. Their range includes the provinces of Newfoundland, Prince Edward Island, Nova Scotia, New Brunswick, Quebec, Ontario and the very southern part of British Columbia. They pose a particular threat to plantations and nurseries. 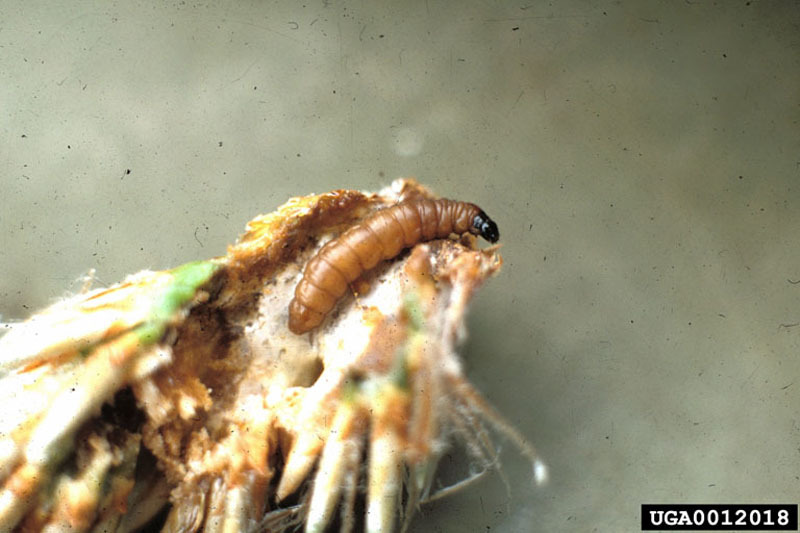 The larvae of European pine shoot moths dig tunnels into the buds and young shoots of a variety of pines, resulting in stem deformation (which can be severe) and retarded growth. However, afflicted trees rarely die as a result. 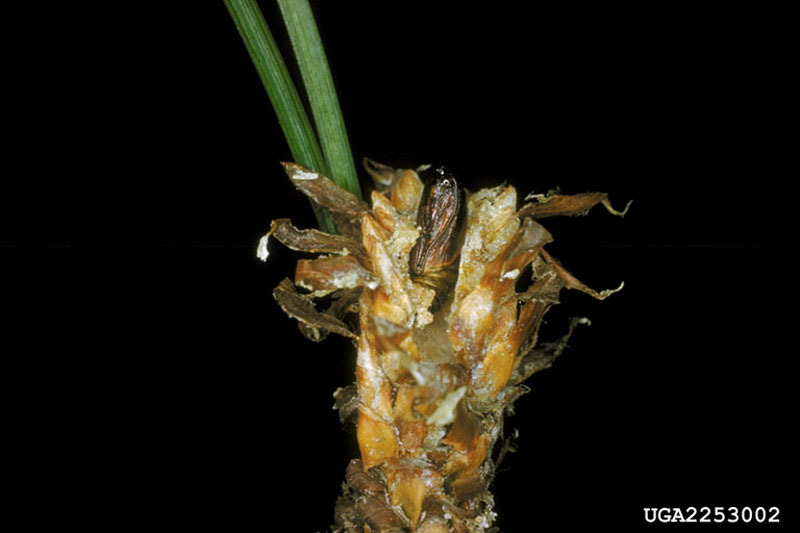 The eggs are laid separately at the base of current-year needles or on buds. As soon as they hatch in June, the young larvae establish themselves on the needles and weave a silk-like shelter for themselves where they start to feed by boring inside the needle. The result is a visible browning of the foliage. They then attack and scoop out freshly opened buds (they can migrate from bud to bud), and later penetrate inside the shoots where they dig tunnels and overwinter. The following spring, they renew their attacks on buds and new shoots, which is when they cause the worst damage. 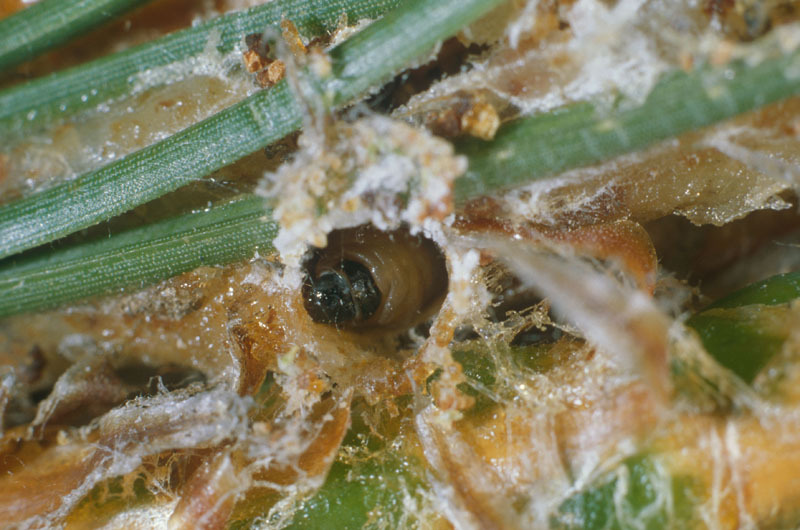 Signs of an infestation by these insects include dry, twisted needles at the ends of twigs, accumulations of resin around buds, as well as withered buds. Infestations stunt the growth of shoots, resulting in their deformation and the emergence of numerous adventitious buds. Severely damaged trees resemble bushes decorated with a scattering of witches’ brooms. 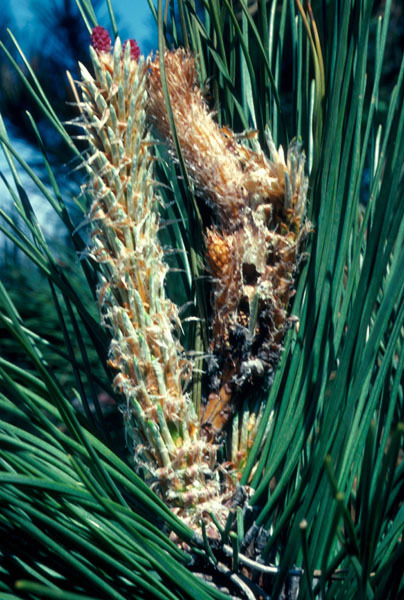 European pine shoot moths prefer to attack young trees in plantations (less than 15 years) and trees grown for ornamental purposes. 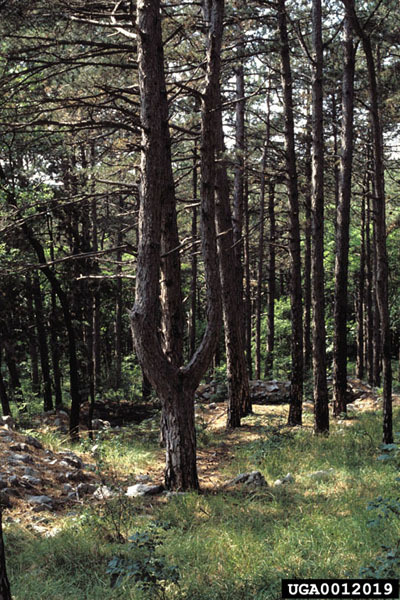 If not controlled, they can destroy new plantations of red pine, their preferred species in North America. 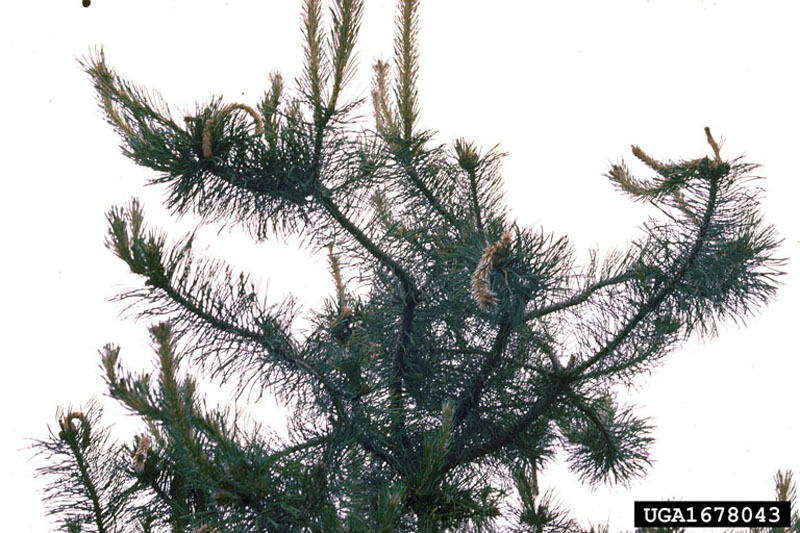 However, they attack other pine species, such as Scots pine, ponderosa pine, and mugho pine, an ornamental species. Prompt detection of the insects is important because their spread can then be limited by cutting and burning infected shoots. Until recently, attempts to control the insects through the use of introduced parasites have not been as successful as hoped. A contact insecticide has had to be used in severe cases.